The RCEP agreement, which is expected to be signed in November, will pave the way for milk and milk products from other countries, affecting small and marginal farmers especially in Kerala, who are not ready to compete with their New Zealand and Australian counterparts, said K Raju, Minister for Forest, Animal Husbandry and Dairying. The milk products from these countries would be price competitive and the elimination of tariff lines potentially opens up much larger possibility of Indian milk producers facing pressure from countries like New Zealand and Australia, the Minister said, while addressing the 46th Dairy Industry Conference here on Thursday. He pointed out that the inflow of cheaper raw materials for reconstituted milk might affect the market for the natural milk produced by our dairy farmers. A unique feature of the Indian dairy sector was the high share of the consumer rupee flowing into the hands of the primary milk producers, thanks to the operation flood programme. 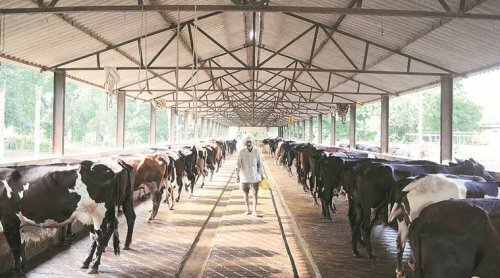 “It is feared that the opening up of the dairy sector hastily to global competition will be a recipe for disaster unless the small producers are provided with appropriate policy support,” Raju said. The Minister urged the Centre to hold discussions and consultations with all State governments before finalising RCEP. “It is requested that the RCEP objectives may kindly be revisited and revised so that opening up of dairy sector in Kerala to external competition from developed countries can be prevented,” he said. Sangram Chaudhary, Executive Director, National Dairy Development Board, said that India’s per capita consumption of milk is about 350 gms per day — lower than the developed countries. The growth in population and consumption would continue to stimulate demand for milk and milk products. Even though India is the largest milk producer, the average productivity of about 4.90 kg per day, which is also lower compared to other dairy developed countries. Given the growing market for milk and milk products and the untapped potential in the dairy sector, Chaudhary emphasised the need to propagate modern dairying and livestock management practices, which are technology-driven and are efficient.